Today is Friday the 13th. An unlucky day if you believe in that type of thing. According to history, it's a relatively new superstition only gaining in popularity during the past century and no one really knows for sure how it came about. One connection that has been made is based on Christianity. Friday was the day of Jesus' crucifixion and there were 13 people present at the Last Supper. That number at the dinner table has long been an issue for my 94-year-old mother. Many a time at family meals she has refused to sit because it would bring the total doing so to 13 which would bring death to one, she says. There's no way to convince her that she's being a bit foolish. Better safe than sorry is her tenet. Mom uses that principle in regards to a lot of other superstitions too, from walking under a ladder to tossing salt over her shoulder after knocking over the shaker. These are superstitions that simply say we are leaving nothing to chance. Others, however, can be frightening to believers as they are beyond their control. For example, a bird hitting a window Mom sees as a portent of death. Nothing can be done to stop it from happening to her mind. Despite the fact that it happens often with no tragedy, the unfortunate one or two times it has coincidentally occurred is all the proof she needs. The majority of people see superstition for what it is — a behaviour in which we have all at one time or another participated, whether we were aware or not. We dodge the black cat. We knock on wood. We play the eight ball. We wish on a falling star. We cross our fingers. We check our horoscopes. And we do most of it for no other reason than it gives us the creation of a certainty, however, false. We really just want that feeling that we do have some control. 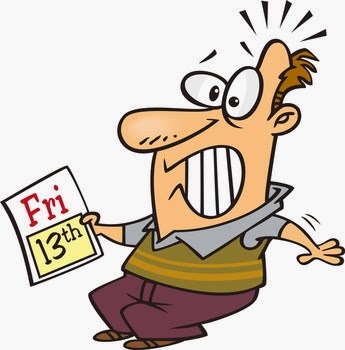 So for all of us superstitious folks this Friday the 13th here's an image collection from Clipart.com that everyone should enjoy. Touch wood.